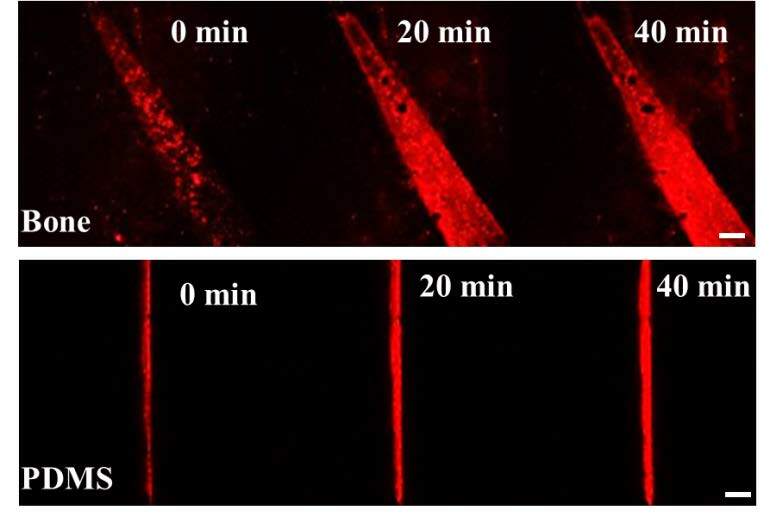 A crack in a high mineral-content material, like bone or a synthetic mineral/polymeric composite, generates ion gradients which can be utilized for active targeting and repair. Employing is technique, an active self-propelled particle-based detection, delivery, and repair strategy for cracks is designed by utilizing the damaged matrix itself as both the trigger and the fuel. Our approach augments current research methods focused on promoting bone healing by delivery of a therapeutic agent to the bone via passive diffusion. The targeting mechanism was used to deliver fluorescently labelled drug (sodium alendronate) loaded nanoparticles, confirmed using a confocal microscope and then using MTS assay. The colorimetric assay measures increase in cell growth, induced by the drug, signified by increase in optical density and confirms the delivery of an active agent and thus induced cell proliferation.